THERE seems to be a hundred eateries in Cabramatta from the glitzy (with neon-flashing lights, gilt ornaments and blaring music), to the tiny (that have a few ageing tables and chairs with a nook crammed with a handful of cooks boiling, frying and grilling). What they all have in common is that they will almost certainly have pho available (and what seems to be hundreds of varieties of it). 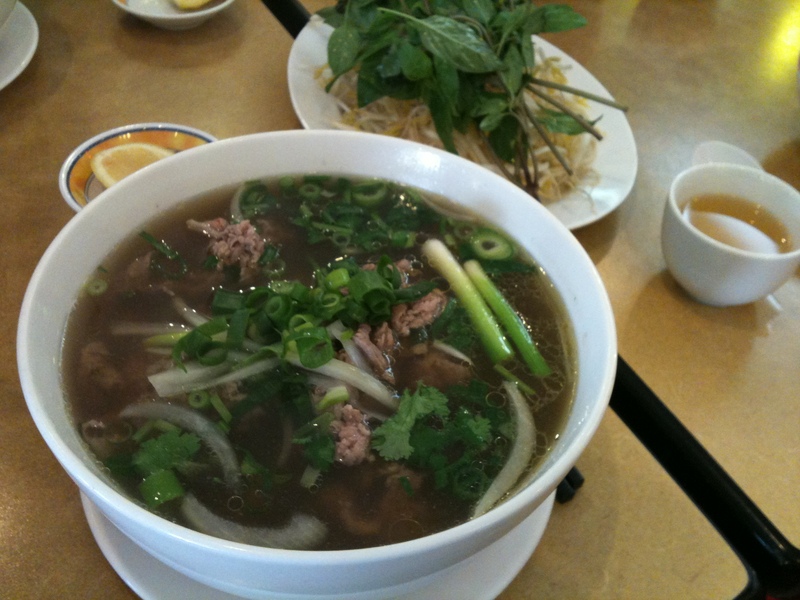 Cabramatta – Sydney’s “Little Vietnam” – is a good place to savour pho, Vietnam’s “breakfast of champions”. Pho (pronounced “fir”) is that wonderful yet simple fragrant soup laden with rice noodles, topped with meat and garnished with herbs. Phu Quoc (near a corner of John and Hill streets), isn’t pokey, tiny or glitzy (but it has some neon), and, yes, it serves pho. It takes me 45 minutes to get to Cabramatta and I usually make the most out of the trip by exploring the warrens of lanes in the shopping area buying up on foodstuffs and eating. Phu Quoc was discovered by chance on one such visit. My children, who are lovers of ‘noodle soup’ (i.e. pho), just stormed into the place one Sunday morning and have had a regular table there ever since (unfortunately they don’t pick up the bill or have a line of credit there). They affectionately call it the “noodle cafe”. The restaurant is clean, provides baby high chairs, has the ubiquitous long communal tables adorned with sauce bottles; tissue boxes; tea thermos and cutlery on hand; and the staff are welcoming of families (and put up with the odd spill). It gets popular from 9am when it opens with locals cramming into chairs, and I have even spotted Maeve O’Meara (of SBS Food fame), there. Phu Quoc’s pho tai ($9.50 for the large bowl), is generous and aromatic. It is accompanied by a plate of Asian basil, bean sprouts and lemon wedge (which is used to ‘dress’ the pho). The pho itself is full of thin slices of raw beef (which is slowly cooking in the steamy broth), with chopped spring onion, coriander and slices of onion. Underneath lie a pile of slippery white rice noodles. But what makes pho, well, pho, is the broth. Phu Quoc’s beef broth is dark brown but not murky (it has obviously been skimmed constantly during its hours of simmering), and wafts of star anise with hints of cinnamon. The broth is hearty with those blends of cinnamon and star anise flavours lingering in the mouth. The usual practice is to dress the pho with torn Asian basil and bean sprouts and depending on your constitution – chilli. The basil adds a ‘rawer’ fresh liquorice flavour to the broth. The freshly cooked slices of beef were tender with that milky raw beef flavour that fills the mouth while the rice noodles were not overdone and had just the right firmness to them (they do get a tad soft if wallowing in the soup for too long). If you want to eat pho the “Vietnamese way”, the traditional practice is to dip the strips of beef into hoi sin or chilli sauce (and of course bottles of these are on the table), before chewing. When finished off with a tall glass of cafe sua da (iced coffee) it’s the ultimate power breakfast to energize the body before crashing through the crowds of shoppers in Cabramatta’s maze of lanes. The verdict: A hearty yet refined and aromatic pho which is true to the style. Phu Quoc champions the breakfast of champions. 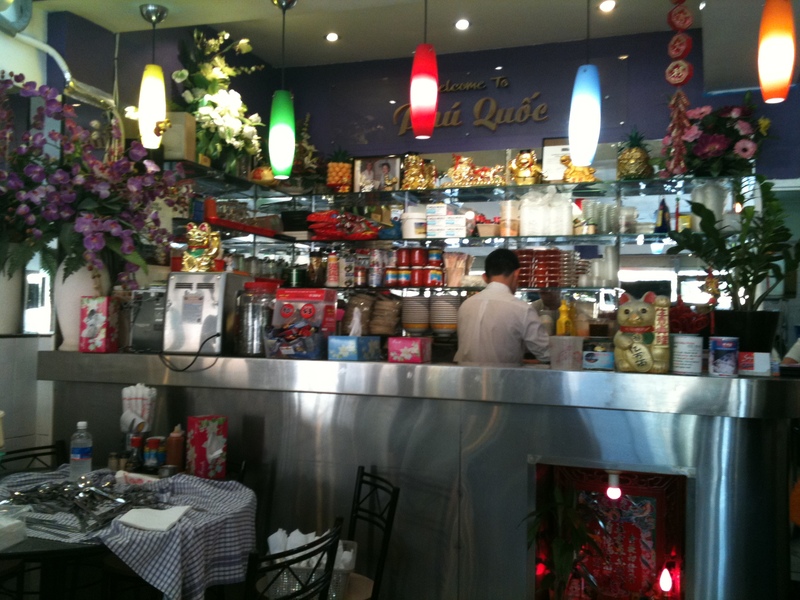 What: Phu Quoc, 11/117 Cnr John & Hill Street, Cabramatta, NSW 2166. Phone (02) 9724 2188. Open seven days from 9am to 9pm. Ate there: 19 September 2010. This entry was posted in Casual dining, Hawker food, New South Wales, Street Food, Sydney, Uncategorized, Vietnamese and tagged Australia, Cabramatta, Food, Phu Quoc Vietnamese Restaurant, Sydney, Vietnamese. Bookmark the permalink.